this is a record of the journey undertaken by my me at the beginning of 1999. my sister, louise - ardent cyclist & fellow bibulant was my travelling companion, and I hers, on this discursion. we were originally going to attempt the c2c, but a number of factors altered this plan, the most significant being the weather conditions at the time. others such as the convenience of family members to visit at the end of the route played their part. the decision to attempt the journey at the beginning of march was not difficult, we're both winter lovers, and the potential for a spot of troublous weather added to the challenge. i've written the journal for 2 reasons. firstly as a narrative of the journey itself, which perhaps some readers will find entertaining; and secondly as a guide for the route. i hope that some potential undertakers find the information of use. as an introduction to us: i could be described as a utility cyclist. i use my bike for commuting, shopping, and other journeys, as well as for day trips, but i have only a little experience of touring. 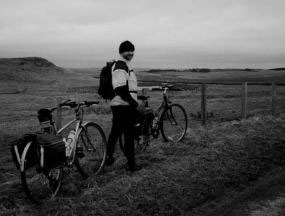 lou is a far more experienced tourer than i. she also uses her bike for general day to day travelling. maps - we took the official sustrans offering, some 1:50,000 landrangers, and photocopies of relevant pages from an aa road atlas, with the route marked. gloves etc. - i had 2 pairs of gloves (one as spare), and boy, was i glad of them. i also tried to use layers of clothes. water/windproofs were a must. we booked only two places in advance, and took our chances with the others. this did not turn out to be a problem, but it will depend on the time of year. the reviews of the establishments are as we found them, and completely subjective. E&OE.